Each year, my honors chemistry class eventually gets to the point where thermodynamic quantities and the relationships between them are introduced. For many students, the very nature of the ideas within thermochemistry often creates a sense of overwhelming abstraction that is difficult to overcome. Of all these ideas, the concept of entropy has given both my students and me the greatest trouble. This year, I was determined to change that. I wanted to better understand the concept of entropy myself and search for more effective methods teaching it to novice chemistry learners. Fortunately, thanks to Theresa Marx and Erica Posthuma-Adams, I was introduced to an engaging activity that really improved how my students (and me) think about entropy—the Boltzmann Bucks game. If you are looking to go beyond using traditional, arguably misleading, definitions of entropy involving “disorder” and “messy bedroom” analogies, this activity can serve as a wonderful opportunity for students to more accurately conceptualize entropy. Regardless of the analogy or example, they were simple to use due to their familiarity with students’ past experiences and I could get students to consistently predict when entropy was increasing or decreasing throughout a process. However, I never truly felt as though my students understood the overall concept of entropy and its explanatory role for why natural processes tend to go in one direction and not the other. As a teacher, it felt more like I was just giving them a word to know, telling them when it is increasing or decreasing, and then just informing them that the universe tends to favor certain directions for processes. It was unlike any other feeling I have had teaching a specific concept in chemistry; completely disconnected from understanding but somehow tricking myself and my students into thinking understanding was taking place. To relieve my own personal stress with this feeling of inadequate understanding, I started to look more closely at the concept of entropy through various resources. It wasn’t long before I realized an essential characteristic of entropy that had been completely vacant from my own understanding and, subsequently, my teaching—its simple relationship to probability. Suddenly, terms that I had heard before but never took the time to fully comprehend, such as microstates and distributions, started to bring a sense of clarity to a topic that had always been fuzzy to me. But developing an understanding of these terms, their relation to probability, and how it all fit together to describe the concept of entropy was not an easy task for me. So how was I supposed to get my students to arrive at a similar revelation? Instead of scouring the Internet for some kind of activity, I reached out to my PLN of educators and, as usual, they did not disappoint. It turned out that there was a JChemEd article, Give Them the Money: The Boltzmann Game, a Classroom or Laboratory Activity Modeling Entropy Changes and the Distribution of Energy in Chemical Systems,1 describing an activity that appeared to be exactly what I was looking for. While I strongly encourage you to give the article a read for more details, I will try to summarize the activity and some of the key points made in the article. What is the game supposed to model? What the Boltzmann Game models is how energy is distributed in real chemical systems. In particular, the authors suggest that this game simulates the harmonic oscillator model of vibrational excitation, which describes how energy is quantized and constantly being exchanged between the molecules of a system. How does this game compare to other activities meant to model this concept? The inherent value of the Boltzmann Game stems from the lack of simple, inexpensive, and engaging classroom activities that appropriately model the concept of entropy. More specifically, the authors suggest, “what seems to be lacking are simple quantitative activities that students can participate in that effectively convey the essential probabilistic nature of entropy". All students will form teams of two. It doesn’t matter whom you are paired up with since you won’t be together for long. Every student receives one Boltzmann Buck (B$) (found in supporting information), which represent 1 packet (quantum) of energy. The “inner ring” students from all teams form a circle facing outward while the “outer ring” students will form a circle facing their partner. The result should be two circles, with the two students in each team looking at one another. After all rounds were completed, students came back to the classroom and were told to copy the data into their notebooks. The following table reflects the data we gathered that day (figure 2). What does energy have to do with probability? Why isn’t the most probable distribution of money one where all players have the same quantity of money? What I loved about this question was how many students intuitively came up with a similar explanation. The majority of them realized that the number of ways for the money to be distributed equally between all players was incredibly small compared to other potential outcomes. It simply was too improbable. Understanding the role of probability with respect to the distribution of money was essential if they were going to connect how this game modeled the probabilistic feature of entropy. After a brief class discussion about their answers, I followed up with another question to see if they could apply new information to their model. Would the energy distribution be any different if more energy was added (I give you more B$)? 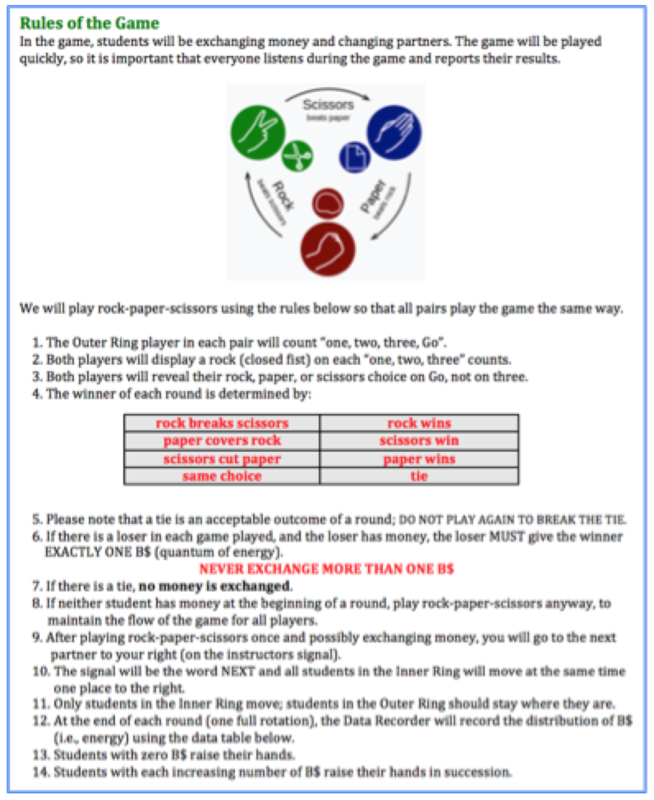 While this question was not as widely understood initially by my students, several of them realized that if I inserted more money (energy) into the game, there would be a greater distribution (a higher average) and the number of players with zero would decrease. It was at this point that I introduced the thermodynamic terms microstate and distribution. In short, I talked about how the number of distinct ways energy can be distributed throughout a system is known as a microstate. In our game, this would be like describing how much B$ each person had at any given point in time. Since calculating the possible number of ways each person could have B$ can quickly get out of hand, our game focused on collecting information on the distributions of B$ (energy). As the data suggested, some distributions of B$ (energy) were more probable than others. This increase in probability of energy distribution directly corresponds to an increase in entropy. Based on this information, I finally asked them to describe how entropy is intimately related to probability in their own words. Though we did not get in to the details of how we could quantify the number of microstates using Boltzmann’s entropy formula (S = k·lnW), I thought it would be useful for students to calculate the number of ways (microstates) a particular distribution of money could be made. By doing this, they could visibly see an actual quantity for a particular distribution and compare it to other distributions. Through comparisons, they could literally see that some distributions were simply far more probable than others. To determine these quantities, I showed them how they would need to involve the use of factorials. This distribution can occur in roughly ninety billion ways; far more than any other distribution. Calculating the number of ways a particular distribution could occur was also useful because it forced students to realize that different distributions were not a matter of possibility, but probability. When discussing topics such as entropy and spontaneity, we often describe one direction of a certain process as impossible. For example, we point to extreme examples like dropping a glass cup and watching it shatter in to a million pieces. We declare that the reverse process, the million pieces coming back together to form the original glass cup, is impossible! Or how energy always flows from warmer objects to colder objects and the reverse is impossible. However, once we understand the probabilistic nature of entropy, we make the shift from declaring particular directions as impossible and instead, view them through the lens of being so incredibly improbable that we can be reasonably confident it will never happen. Viewing the directionality of processes this way may seem trivial since the end result is essentially the same, but simply declaring one direction as impossible without adequate explanation as to why we believe this completely removes any need for understanding why certain processes tend to go in one direction and not the other. So How Did This Game Impact Understanding of Entropy? Getting my students engaged with this activity and the subsequent conversations that followed, opened up doors for the types of questions I could ask my students with respect to explaining why spontaneous reactions tend to increase in entropy. In the past, I would ask a simple question like, “which state of matter has a higher entropy—solid or liquid?” Nearly all students would answer correctly but when pushed to explain their answer, they would simply rely on concrete explanations such as, “the particles in a liquid are more dispersed.” In our recent exam, I asked the exact same question and got answers that absolutely blew me away (see figure 4) compared to previous years. Students were including ideas such as probability and comparing the possible number of microstates and distributions of matter in a liquid compared to a solid. This was something I had not seen before and it was obvious their overall explanatory abilities regarding entropy had improved. Additionally, this new understanding helped them more easily conceptualize spontaneity and make predictions without simply resorting to algorithmic “tricks” I had relied upon in the past. More students were viewing problems related to entropy and spontaneity in a fundamentally different way than before. The Boltzmann Game not only helped my students construct a more meaningful and accurate definition of entropy, it provided a memorable experience for students connect with their explanations regarding entropy in a more effective way. As stated by the authors, entropy is seen as a measure of “the number of ways a state can have the same overall distribution of energy”, and any differences of entropy are measures of the “relative probability of two possible distributions”. Statements like this would have gone right over the heads of my students had we not played this game. This realization was a game changer for me and I will most certainly do it again. Additionally, I plan to incorporate different uses of the game that were suggested by the authors such as modeling the exchange of energy between a system and its surroundings. Log in to have access to Supporting Information: a pdf of Boltzmann Buck images from the original JCE article and a handout I use with students as we work through the activity. 1. Hanson, R. Michalek, B. Give Them the Money: The Boltzmann Game, a Classroom or Laboratory Activity Modeling Entropy Changes and the Distribution of Energy in Chemical Systems, Journal of Chemical Education. Vol. 83 (4), April 2006, p. 581. 2. The Boltzmann Buck is reused with permission from the Supporting Information of the activity outlined in the Hanson, Michalek cited above. Copyright 2006 American Chemical Society. Find help accessing the article.